If you want a survival knife that will make it to hell and back, look no further than our latest Badass Knife of the Week. The ESEE-4 from ESEE Knives is one of the best all-around blades for outdoor tasks, earning high marks from bushcrafters and campers alike. The 9-inch survival knife boasts a large yet versatile 4.5-inch blade. Made from 1095 carbon steel, which is praised for holding an edge and being easy to sharpen, the blade is coated with textured powder coating to reduce the steel’s reflective qualities and provide some protection against corrosion. With its blade width of 1.25 inches and cutting edge of 4.1 inches, the ESEE-4 is designed for heavy duty use, which includes everything from batoning wood and feathering sticks to hunting and skinning game. A finger choil even allows you to choke up on the handle for smaller, more controlled tasks. The ESEE-4 has a full tang construction with black linen micarta handles to keep the knife firmly in your hands. For even more security when wielding the large knife, the rounded pommel features a lanyard hole. 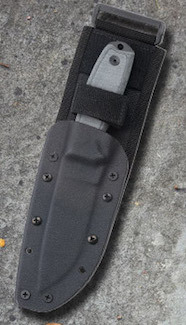 A black Kydex sheath with MOLLE locks rounds out one of the best survival blades on the market. For more information on this Badass Knife of the Week, check out the product page for the ESEE Knives ESEE-4.